After months of rumours and leaks, Google has officially introduced the Pixel 3 and Pixel 3 XL high-end smartphones at its hardware event in New York. The Pixel 3 and Pixel 3 XL like its predecessors are differentiated by the screen and battery. The Pixel 3 sports a smaller 5.5-inch display while the Pixel 3 XL has a 6.3-inch display. The Pixel 3 XL has a notched display on the front for all the notch lovers out there and the Pixel 3 comes with a notch-less display for all those who’re looking for one in 2018. Furthermore, both the devices pack the flagship Snapdragon 845 chipset, clubbed with 4GB of RAM. Right now, Google announced the phones in the United States, but it’s yet to reveal Indian availability of the phones though. 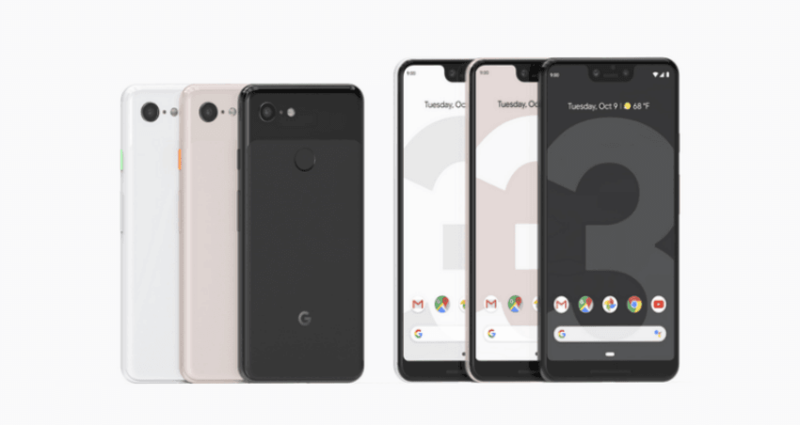 As mentioned above, the Google Pixel 3 comes with a 5.5-inch display on the front, whereas the Pixel 3 XL has a 6.3-inch screen. Last year’s Pixel 2 XL faced a lot of criticism for its Quad HD+ OLED display, so Google has taken a huge step forward and included Full HD+ display on the Pixel 3 XL. Yes, both the Pixel 3 and Pixel 3 XL flaunt Full HD+ OLED displays on the front and they’re protected by Corning Gorilla Glass 5. Both the displays are HDR compatible. They both measure 7.9mm in thickness. The Pixel 3 measures 148 grams, while the Pixel 3 XL has 184 grams weight to it. Under the hood, the Pixel 3 devices are powered by the Qualcomm Snapdragon 845 SoC, paired with 4GB of RAM. Storage options include 64GB and 128GB and there’s no room for microSD card. They also ship with Pixel Visual Core which helps in better image processing. The devices boot Android 9 Pie out of the box and being a Google device, it comes with a promise of minimum three years of OS and security updates. Google has launched the devices in three colours- Clearly White, Not Pink and Just Black. They both retain the dual front-facing speakers from their predecessors. For the first time, Google devices are coming with Qi wireless charging. The Pixel 3 has a 2915mAh battery, while the Pixel 3 XL has a bigger 3430mAh battery. As for the sensors, the Pixel 3 devices feature Active Edge sensor which quickly allows you to trigger Google Assistant, rear-mounted Pixel Imprint fingerprint sensor, proximity/ambient light sensors, accelerometer/gyrometer, magnetometer, barometer, Android Sensor Hub and Advanced x-axis haptics for sharper/defined response. Lastly, we have the section which Pixel devices are famous for- cameras. The Pixel 3 and 3 XL both feature a single 12.2MP dual-pixel sensor on the rear side with f/1.8 aperture, 1.4um, autofocus + dual pixel phase detection and OIS + EIS. The cameras can record 1080p videos at 30fps, 60fps, 120fps. The Pixel 3 devices have dual front-facing cameras of 8MP wide-angle and telephoto lens. During the launch event, Google also announced the prices for India. The Google Pixel 3 will cost Rs 71,000 for the 64GB variant and Rs 80,000 for the 128GB option. The Pixel 3 XL, on the other hand, retails for Rs 83,000 for the base variant and the 128GB variant is priced at Rs 92,000. Google has partnered with Flipkart to sell the two Pixel 3 devices, but the availability is yet to be revealed by both the parties. Also, the Pixel 3, 3 XL will be available at Croma, Reliance Digital, Bajaj Electronics and other state-wide major retail stores. Poor design with ugliest looking notch..makes me think, does google have a device design team at all? ?Not able to think of any reason why anyone would spend this much for this phone. Weak battery…how can any Android phone compete with honor mate20 pro…huwai ticks screen camera and processor also BATTERY with QUICKER CHARGING.